Garret Hohl (@garrethohl): So everyone, will the Flames repeat? Yes or no. Matt Cane (@cane_matt): If they hadn’t made the moves they did this summer my gut would say no. But with everyone they brought in I think they can do it. Muneeb Alam (@muneebalamcu): How many of us were even around the last time that question was relevant (1989)? DTM About Heart (@dtmaboutheart): I still say no and I don’t think it will be close. Matt: Also worth noting: Calgary had a phenomenal penalty differential last year and that’s fairly repeatable. They seem like a team that focusing on the 5v5 gives the wrong picture. Garret: Yes. Best in the NHL. Last February I estimated that to be 11 goals just from their differential, about two wins. Note: I had their goal impact as 2nd overall despite best differential, as their power play was a bit weak. Conor Tompkins (@null_hhockey): We also need to look at the other side of the coin. The team they were battling (LA) had an unreal run of unlucky/fluky/weird play. You could say the Kings missed the playoffs more than the Flames made the playoffs last season. Muneeb: I think it’ll be close, but they’ll just miss. Had fewest points of any playoff team as it was (though more ROW than, say, WPG), and then you have LA, Dallas, and San Jose. Matt: That’s a big difference, Garret. Vancouver will be out this year though. Garret: Ya but also the Vancouver Canucks were a bit lucky last year too, and they look ready for Matthews if they don’t get goaltending, depending on how the Sedins age. Micah Blake McCurdy (@ineffectivemath): I expect Calgary will just sneak in, I think the new personnel are amazing. Garret: Will Giordano be healthy? How much impact will Hamilton have? How much impact will Frolik have? Conor: Can Hartley coach in a modern style? I think he’s one of their biggest weaknesses. Matt: This will be an unpopular opinion probably but I Giordano is going to start to slide. He’s 31 already, coming off an injury. “Asmean” (@asmean_t): I believe they’re the worst possession team to (barely) make the playoffs in a pretty long time. They got there in part thanks to an extremely unlucky LAK team as Conor said and with a high PDO. If you look at the top PDO teams, most had elite talents that consistently have high sh%, or elite goaltending. Flames in my mind have none of those. Garret: War-On-Iice had them at a 44.2 per cent Score-Adjusted 5v5 Corsi last year. What do you think they will be this year? Matt: 47, 48 maybe. I’m a big Dougie Hamilton fan so I think the impact could be large. Conor: I can see 48. Their bottom 6 is still terrible IIRC. 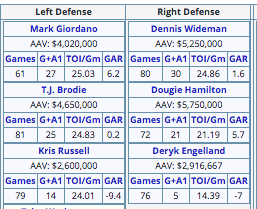 Wideman/Engelland/Russel aren’t impressive either. Arik Parnass (@arikparnass): I’ll say 48 as well. I think teams are going to start to cluster more in the next few years though. There’s so much depth now and so few plugs. Even bad teams could have 45%+. Asmean: I am not confident Hamilton could improve possession in a significant manner. Hamilton played with the best possession drivers in Boston and I think we could be overestimating the effect he could have in that regard… especially if they pair him with Russel or a player of similar caliber. Micah: But if Vancouver don’t make, as they surely won’t, and calgary doesn’t either, who does? LA and …? Garret: Fun fact, Frolik had a better Corsi rel than all of their regular players, despite playing on a stronger team. SJS for the sleeper! I could see a LA, SJS, ANA combo. You need 3 teams from the Pacific no matter what though. Three of CGY, EDM, VAN, SJS, ANA, LAK, ARI are going to make it. Just like last year though, both wild card spots are going to the Central (IMO). Conor: I think Doug Wilson closed that window. Matt: That’s the advantage for Calgary too, they okay in a relatively weak division. Although I do think SJS and LA rebound. Micah: I won’t be too surprised if it’s LAK/ANA/SJS, but I can see the third spot going to CGY too. None of the others scan. But there are lots of people out on the twitters saying neither calgary nor san jose will make it and that’s not true. 1) Their penalty differential is great. In this regard Calgary is a smart team. 2) Their shooting % will probably regress, especially Monahan. 4) Any increase in CF% will probably be offset by PDO regression. 6) I think their hockey ops group has some interesting ideas, judging by recent moves. 7) Overall I think they ll be in the 93-97 pt range, no playoff unless they are lucky with injuries and make some moves in-season. Asmean: It’s hard to know just how much impact Hamilton will be on an atrocious possession team given that his most common linemates IIRC in Boston were none other than Bergeron, Marchand and Chara. Is he going to be impactful? Sure. I just don’t think he is the answer to Calgary’s glaring problems that some are making it out to be. In other words or to put it simply, I don’t know if Hamilton can be as dominant (especially defensively) with subpar linemates. Matt: He’s been over a point per 60 at even strength in each season so far with a positive Corsi Rel each year too. He’s not exactly dragging anyone down. Asmean: Yeah, he’s been excellent. I’m not implying he was carried or anything like that but I think it’s fair to say he’s also benefited from playing with high end talent. I just have reservations about how dominant he could be in Calgary. Carolyn Wilke (@classlicity): Honestly, I think they land about the same, point wise, but miss the playoffs because LA & San Jose will improve. Anaheim is a lock. Good defense will improve their average goaltending, special teams haven’t been shaken up much – adding Frolik just makes their PK stronger. Better put, good defense means they can survive average goaltending. I have a hard time not seeing both Wildcard spots go to the Central, because even the worst team (Colorado) have a legit shot at making the playoffs. DTMAbout Heart: The best way I can describe Calgary is that they will be a better team but with worse results. The additions of Hamilton/Frolik will be helpful mostly because that means CGY’s depth won’t have to play as much. I can’t see the new acquisitions outweighing their bad shot attempt numbers, some PDO regression and their crazy numbers with the goalie pulled. Carolyn: Exactly. Everything they did this summer sets them up for long-term success, but will probably not pay off in the short term, unless LA sees similar issues as last year. And you just can’t count on that. “Garik16” (@garik16): [To original question] Probably not. Matt: So am I the only vote for playoffs? “Moneypuck” (@moneypuck_): IMO, a lot of Calgary’s chances hinge on the quality of goaltending SJS gets from Jones. If Jones play the way SJS hopes, I can’t see Calgary getting a spot. Unpopular opinion on this thread, but as long as Miller/Markstrom aren’t a complete tire fire, Vancouver will be in the wild card hunt too. That’s a nice way of saying I’m nuts on Vancouver, haha. Conor: I totally agree that Jones could swing this thing in SJS’s favor. Nick Mercadante (@nmercad): SJS is going to finish second in that division. Vancouver will finish behind Edmonton. Yotes will be the second worse team in the NHL behind NJ. Carolyn: I think the Yotes will be worse than NJ. They’re trying really hard to be bad. Nick: True. I mean, splitting hairs I think. Conor: I don’t think that NJ can be last with Schneider playing ~70 games or whatever it was. Carolyn: This is also a very good point – The Yotes #1 is Mike Smith, their #2 is Lindback. Nick: That division is going to crush them though. Oh my. Yea never mind. I’m wrong. I forgot that they are handcuffing terrible with god awful. Plus Larsson will be a year older. He is eventually going to be a stud if they don’t burn him out. As soon as this year. Micah: Coyotes are unshakeably last. Just horrible. “Petbugs” (@petbugs13): Repeat? Unpossible. They will not beat the Canucks in the 1st round. Conor: I think that will have more to do with the Canucks than the Flames. Petbugs: To be honest, I think this comes down to coaching. I just don’t think Hartley has the mindset to coach a possession game. And winning that Adams Trophy didn’t help. The Flames managed to erase the deficits caused by their poor play with an amazing ability to come back late. We all know that’s not sustainable, and I don’t think Hartley can get more than a few % CF out of the increased talent level. That being said, it’s all relative. So what DeBoer does with the Sharks will be just as important. And I just haven’t seen enough of him to know if he can change his style to fit the talent he has in SJ. Micah: Wait Hartley won the coaching trophy? God I blacked that out. Asmean: Yeah exactly; they got incredibly lucky coming back late. If you look at their 6 on 5 numbers, their shooting % is insanely high. I just cannot imagine that can be reproduced. Garret: I think that’s good here. We’ll end it. Everyone is spelling #FLAMS wrong.